Not many locals were shocked to learn that Atascadero City officials allegedly fraudulently obtained and used $8 million in federal taxpayer money from FEMA, revealed by the recent release of its OIG (Office of Inspector General) audit. 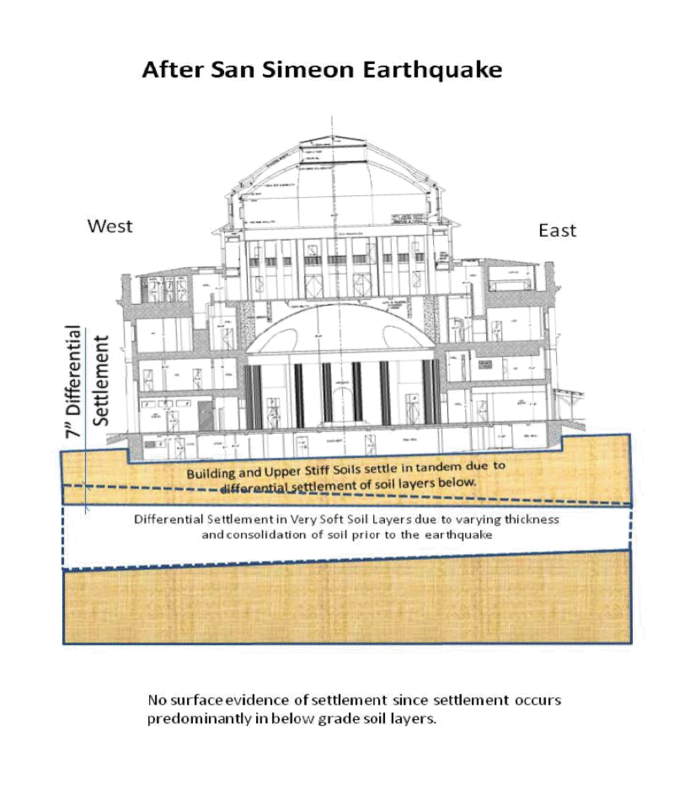 They may find it surprising, though, to realize that those officials also conspired to steal an additional $7.5 million by lying about the condition of the city hall building prior to the 2003 San Simeon earthquake. This fraud was not included in that OIG audit report because it only addressed funds actually dispersed to the city, not the money the city failed to obtain from FEMA. It does, however, demonstrate that the same officials now in charge of responding to that OIG audit repeatedly and intentionally lied about a tilt in the city hall foundation in order to obtain $7.5 million in FEMA funds for repairing the settlement of the foundation. 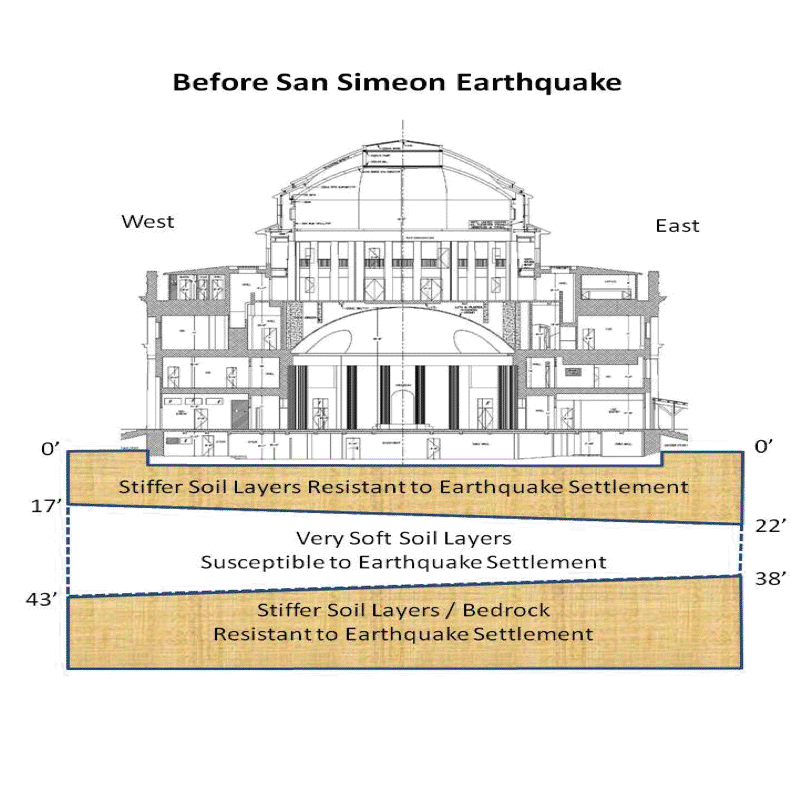 Six months prior to the earthquake, June 4, 2003, a front-page article in the SLO Tribune reported that a foundation-repair company’s survey of the building found a seven inch tilt in the city hall foundation. Other sources cited in that report were the city’s deputy community services director (now deputy public works director), the assistant city manager (now director of community services), the building maintenance supervisor, and previous Mayor Marge Mackey (now deceased). The fact is that knowledge about the pre-existing condition of the foundation’s seven inch tilt was widespread among city officials as demonstrated by this front-page news coverage. Assertions of ignorance are blatantly false. Perhaps the most flagrant of the city’s lies is demonstrated by the pictorial “evidence” it submitted to justify its bogus claim. It’s a photograph taken of the building circa 1915, with cars from that era (Model A or Ts?) parked in front, and without the towering pine trees at the corners of the building that were cut down recently. The city simply tilted this photo to the left. 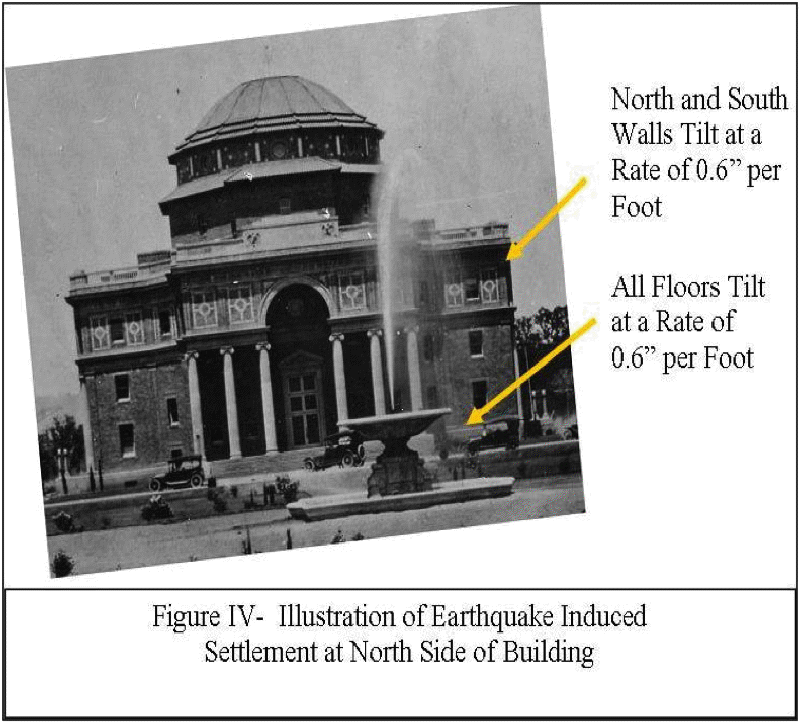 The city also graphically claims the seven inch foundation tilt only appeared after the earthquake. The city also falsely asserted numerous other structural problems, cited in the June 2003 newspaper article, resulted from the earthquake. The March 20, 2012 FEMA OIG audit gives the city 90 days to respond. Now, the same perpetrators in city hall who concocted this and other lies in an attempt to steal federal taxpayer money are in charge of submitting the city’s response. Minutes later, the council was presented with the above evidence/proof that city officials had lied and attempted theft (also on the large screen). They also received the recommendation to remove them from their positions. The council was informed that, if they don’t do so, and authorize those officials to compose the response to the OIG audit, they lack the integrity to occupy their own seats. In response, the council and city staff were completely silent and moved on to the next agenda item. The video of the March 10, 2012 council meeting can be viewed on the Slo-Span website (http://www.slo-span.org/atas/atas_meeting1.html ). The American people care about their neighbors and pool their tax money with FEMA to help folks in dire need of assistance after disasters. Depriving victims of $7.5 million set aside for those actually needy, with phony claims of unrelated damage hurts the intended beneficiaries of our collective compassion, and undermines the public’s confidence in disaster response. Doing so, and authorizing it, render elected and appointed officials unfit for public service. This isn’t just about legality and money. It’s about deceit, corruption, immorality and heartlessness. This infection must be excised or the rot will spread. I want to see the old city hall restored, but I don’t’ want a shroud of shame clouding my vision of the iconic structure. I want to be proud of my town for how it bounced back from the 2003 earthquake, not ashamed it did so based on lies. This may not directly relate to anything specific on the current CCN site, but it may have good general application to the notion of the value of citizen oversight and press scrutiny. Keep in mind that Dixon, Illinois is only 15,000 people, with an annual budget of $8-9 million. And yet their treasurer managed to siphon off more than $30,000,000 in only six years. That’s not a typo- you read it correctly- $30 MILLION. The message: close citizen oversight and scrutiny and aggressive press attention is utterly essential to keep government honest. Remarkable, an article on corruption at Atascadero City and not one mention of Wade McKinney! What are the alternatives for venues to file criminal complaints? Liars and theives working for City of Atascadero? Really? What a surprise? No comments to speak of. Just another case to where society has gone. Theft is ok and nobody cares. David Broadwater always carefully selects his issues, and he does his homework. Righteous dude. Most of you all know that. Those that don’t, time for you to do your homework. Me? Just worked there a while. Leaning Tower of Plaza? not so much. Are you sure all 4 of them are up for re-election? I don’t think so. The seats are staggered 3 come up together and then 2 come up together. But I’ve lost track of which of the last three got elected when? This should be interesting to see if the city council will even address this. With it being an election year I’m sure it’s a hands off topic around city hall. With O’Malley wearing out the town going after the first elected Mayor’s position he should be required to address this issue and make a statement. But of course which way is the wind blowing and what side of the fence will he fall on. Fonzi, Kelly and Clay are also up for election. O’Malley and Clay were present when all of the FEMA stuff went down along with the Rotunda issue and they should at least make a comment on it. With everyone up for re-election, I think you will never hear another word regarding this unless FEMA steps up the pressure or if Gearhart ever gets indicted he may eventually tell the truth. Well lets face it, there was a lot of free money out there after the quake and all the city gov agencies were raking it in. I don’t think the A-Town staff did what they did for self interest, at least I don’t think so? We needed a new youth center, we needed to repair city hall, it was going to cost millions and then this opportunity came along. I specifically recall a certain council member during a CC meeting stating that he wanted to be certain that Atascadero got their “share of the pie”. I don’t think he meant that staff should lie or cheat to get it, I think he simply meant what he said, and that was to get us our fair share and so the staff went out and got us what they considered **”our share”**! We got a 31Ksq’ building all paid for and renovated, plus we got to pocket some extra lease money on it (that was actually a clever move except for the RDA screw up, if they had named other people as RDA administrators it would have legally worked). We got a new youth center and a very nice one and we almost got to fully repair our beautiful historic city hall. It’s all very sad in a way and I know that I’m going to get jumped on for this but I really can’t be too angry with them. I feel like they had their hearts in the right place its just that their morals went out the door!! oopppps…….. No doubt they figured everyone else was stealing our FEMA tax dollars so they had to cheat too in order to stay even(! )…..and I’m sure a lot of other city gov did the same thing. No it doesn’t make it right but I understand how they were probably thinking. Let this be a lesson to our city staff that cheating doesn’t pay. Now we have to pay back funds for the youth center and the bowling alley purchase and we don’t want our city staff to cheat even if they think they are doing it for the taxpayers. They may have-“I feel like they had their hearts in the right place its just that their morals went out the door!” But their heads were somewhere else, catch my drift. True honest people do the right thing when everyone is watching, and when no one is watching, period. If you file a false insurance claim its fraud. If convicted you go to jail and pass go without collecting. That may equal $8,000,000. Yes we will ultimately pay for this. And the city officials will still draw their perks. Cindy, if I rob a bank to steal money with the intent to donate it to a respectable charity, does that make my criminal act less criminal? Of course it doesn’t. Again, when is any impropriety acceptable? Atascadero, don’t you dare take the limelight away from Paso Robles! Seemingly, Paso Robles is contending to be even more corruptive than the city of of Bell, California, so don’t give them any competition!